One of the things Dysfunctional Bob Malm is proud of is his reign as the longest-serving rector of Grace Church, aka St. Dysfunction. Yes, he pretends that one day he looked up and realized he’d grabbed the gold ring, but trust me, he knew all along. And in Bob’s case, staying 30 years, which will soon have happened, isn’t something to be proud of —indeed, it’s been tremendously damaging to the church. So why did Bob stay so long? Clearly, he didn’t plan to do so. Not only did he initially structure the deal on his personal residence for 5 years, but after the vestry foolishly extended the loan it made to him to purchase the place, Bob clearly signaled in writing that he hoped to move on. That didn’t happen, most likely because Dysfunctional Bob couldn’t find another church willing to pay him at a level at his current outrageous level—a level that equals or surpasses many Episcopal bishops. Moreover, on many fronts Bob hasn’t exactly been successful as rector. 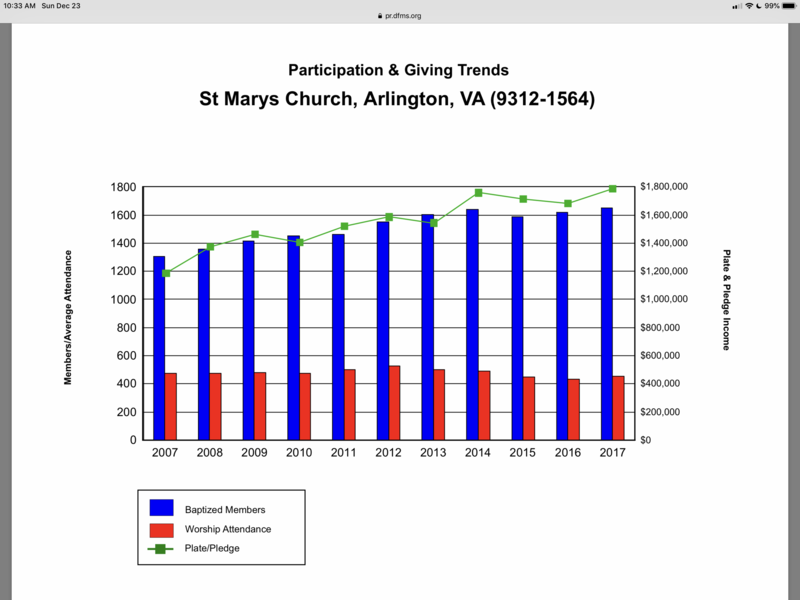 While St. Dysfunction is large enough that some might term it a cardinal church, it’s been slowly declining for many years, losing buying power and active members. Bob’s response? Having folks leaflet homes at Potomac Yards one time and show up at Art on the Avenue a few times. Big deal. Compare this with St. Mary’s Arlington. 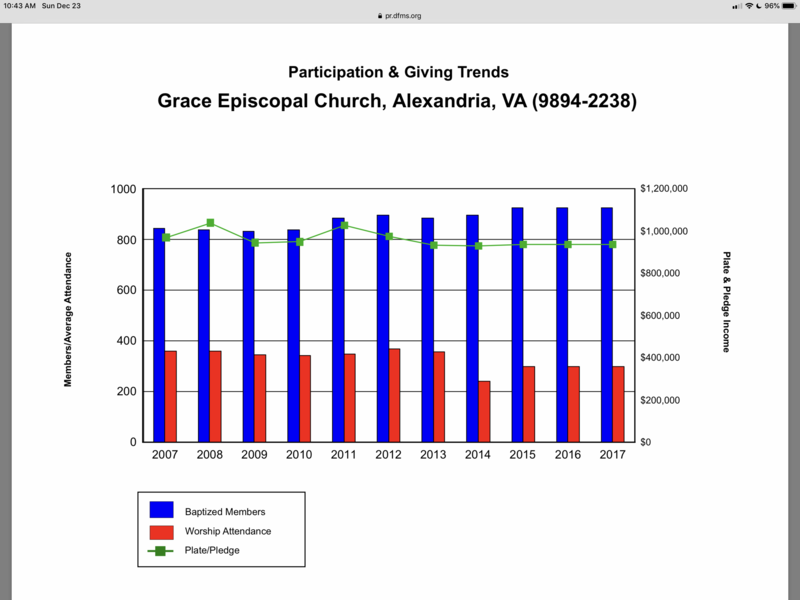 While I have issues with Andrew Merrow, who is thoroughly checked out on multiple fronts and can be an arrogant little twit in private, one has to give him credit: Parish revenues have grown 50 percent over the past 10 years. Compare this with Grace Church’s stats under Dysfunctional Bob. Keep in mind, too, that a flat budget over ten years is, in reality, a 16 percent decrease in purchasing power. Nor is Bob playing it smart. Having lost 2 full-time priests since 2014, with no sign that this is going to change any time soon, Dysfunctional Bob is shutting down the church for the week after Christmas; there will be no weekday Masses until the new year. Not exactly a good way to appeal to the small but loyal group that attends these services, and many of whom date from the days when attending church was normative. But then, having worked so damned hard on Christmas Eve, Bob needs time to regroup. After all, it’s a long time until his month off in the summer. There are many additional signs that Bob has stayed too long. These include resistance to change (Bob’s middle name—right beside Dysfunction), a negative reaction to feedback, a feeling of ownership, a belief that the rules don’t apply to him, and the notion that he’s irreplaceable. 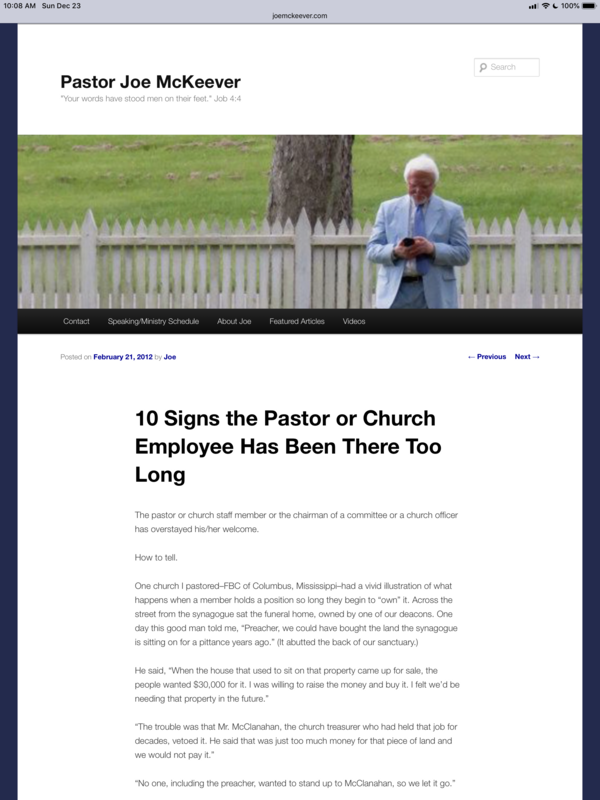 To more fully explore these ideas, check out the excellent article, “10 Signs the Pastor or Church Employee Has Been There Too Long,” written by Joe McKeever and available here. Although written from an SBC perspective, the article’s key truths are valid across denominations, and make clear that Dysfunctional Bob is the poster person for clergy who have stayed far too long.